Look at this easy to clean griddle! This Aluminum Nonstick Square Griddle cookware from Maxam® is an ideal shape for cooking delicious french toast, bacon and eggs, sausage and pancakes, or grilled cheese sandwiches. This stove top griddle offers an easy to cook on surface for kids or adults, and easy clean up with its non stick surface. Every kitchen should have at least one griddle pan in its cooking ware arsenal. Aluminum cookware Is practically unbeatable for all around use. Gives even heat distribution regardless of the type of range used. 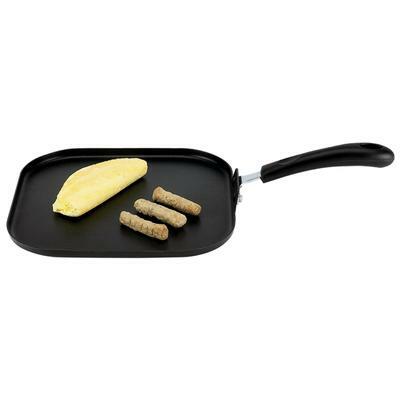 Non stick cookware Has a coating that makes cooking a breeze and cleanup easy. "Pfoa Free" - a nonstick coating Considered safe for healthy eating. Riveted handle Anchored for sturdiness and easy lifting. Hang up handle hole Offers versatility for storage.